One of the most finely crafted guitars money can buy, with a host of truly great sounds. Beautifully designed; wide-ranging palette of quality sounds: from almost electro acoustic-like clarity to juicy humbucker. Only that Tom's favourite Atom with three M Series pickups, hollow body and Bigsby sounds even better! The latest model to emerge from Tom Anderson Guitarworks' Newbury Park workshop in California is the Atom, the guitar that Tom himself says he's always wanted to build. It's the second original single-cut shape from Anderson after the electro-acoustic Crowdster. "It's derived from the Crowdster, but is smaller, has a tighter waist, is thinner and has more contours. The neck joins the body higher up and it incorporates the new neck joint," explains Tom. "The world is pretty reluctant to accept new shapes, but this is something that's been rolling around in my head for some time." Aside from the shape, the body is constructed from centre-joined mahogany with a relatively thin 5mm flat-flamed maple book-matched cap that's perfectly 'dropped' over the generous forearm contour. The natural edge is very cleanly achieved, and you've got more chance of spotting an alien in your local Starbucks than you have a blemish on an Anderson finish. The glass-like sheen of the ultra thin finish (a thin combo of modern paint materials including an acrylic topcoat) is perfect on top, sides and back. The neck is one-piece mahogany (satin finished apart from the gloss headstock face) and uses the standard Atom shape (the same as the Cobra, see spec check). It's a deep but beautifully-shaped profile - with a first fret depth of 20.7mm, and 23mm at the 12th with a slight V'ing. The Indian rosewood board is peppered with old-style 'clay' dots, and to simulate a worn-in guitar the edges are rolled - a properly radiused edge that feels so comfortable, especially for thumb-around styles. Fretting is from special stainless steel wire designed to Anderson specification. There is a choice of sizes but the heavy, as fitted here (approx 2.72mm wide x 1.3mm high), is a perfect modern wire with plenty of height that doesn't feel over chunky. Needless to say the fretwork is perfect, especially the fret ends that are beautifully rounded. The new neck joint is very clever. The neck profile described above stops just before it meets the body just past the 15th fret. It's then shaped with a flat bottom and two flat sides splaying out approximately 45 degrees. It fits into a mirror-image cut-out in the body and is held by two chunky bolts. It's impossible to move and there's not the slightest creak that you can usually illicit from a standard Fender style bolt-on. "I've been thinking about a new neck attaching method for many years. The Fender-style joint, even when executed well, doesn't really hold the neck in position very well. Our joint is a compound wedge, so it requires no pressure at all to keep the neck in proper alignment. It cannot move sideways or longitudinally." "I'd have used only one screw to hold it on, but the adjustable rod is in the middle of the neck so I used two bolts offset of the rod by about 6mm. The bolts are a size larger than the traditional wood screws used on our other guitars, and these are machine screws mating to steel threaded inserts inside the neck. There's actually more surface contact with this joint than the traditional Fender style, and with our production methods, the precision angles are easy to keep correct." 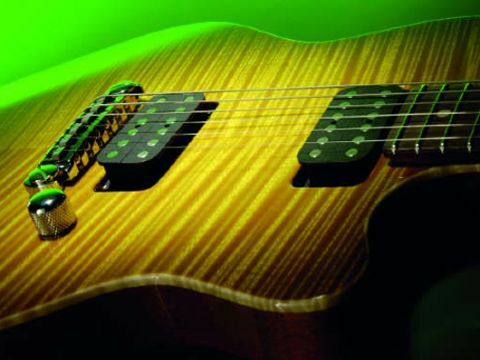 The bridge isn't a million miles from modern adjustable wrap-overs from PRS or Tone Pros. Here, however, it's made by Steve Rowan of Pigtail - a one-man shop in Colorado. "I had tried the Tone Pros wrapover but there were some things I would have changed," says Tom. "Steve is a mad scientist type, and he's also studied old guitars and can play. He agreed to make some mods that he also incorporated into his 'standard' bridge. The bridge is aluminium and sounds much more lively than the zinc bridges others offer. I also wanted a longer string ramp so we had the saddles made about twice as long. I also added pre-machined grooves of an appropriate size for each string." The humbuckers - Anderson's H1-A and H2+A at neck and bridge - mount directly to the body with dual screws on the bass side so they can be placed exactly parallel to the string angle. Both have black fibre-faced bobbins and large flush pole-pieces. The wiring set-up here is the same as the standard Cobra: a five-way lever selector switch, master volume (with resistor/capacitor treble bleed network) and master tone with pull/push coil-split. The five-way selects bridge humbucker, neck-facing single-coil of the bridge humbucker, both humbuckers (split to a hum-cancelling single-coil mix by that pull/ push switch), neck-facing single-coil of the neck humbucker and the neck humbucker on its own. The Atom sounds pretty musical unplugged and its light weight and sparkling resonance hint at what's in store plugged in. But after playing this for an hour we're a little confused: what the hell is the Atom? For example, select a clean amp tone, reduce the volume and select the split-coil middle position mix and you're hearing - through a guitar amp - a perfectly usable electro-acoustic tone. Select either humbucker, turn up the guitar and dial in a dirtier amp voice and you're wailing with a juicy but defined Les Paul-like voice and such fluid playability that, well, it's like a different guitar. Switch to the single-coils and, boy, has this beast got twang: in fact if you just use the centre three positions (and the single-coil mix mode) it's like the best Telecaster you never owned. And then there's the tone control. Back it off a little and the high-end clarity, essential for Fender-like tones, is reduced to more accurately ape a twin-humbucker guitar from Kalamazoo - you can go softer still, reduce the volume, and with a cleaner amp have a superb old jazz tone. Fully off, with humbuckers selected, you have utterly outstanding woman tone. But underpinning all this sonic madness is a perfectly crafted guitar. It has a light weight but doesn't feel insubstantial; the neck disappears in your hand, and the frets are so fluid you don't notice them even though there's plenty of height to dig in and bend. The control system is so well placed and intuitive, you know you could gig this in any style or playing situation and the instrument at least wouldn't let you down. Tom Anderson constantly pushes guitar making forwards, absorbing any new idea or technology he can to make a better guitar. Here, the new body shape introduces a highly effective neck joint, a new Anderson-approved wrap-over bridge mated with standard Anderson favourites and features like the Buzz Feiten Tuning System, stainless steel frets, even Elixir Nanoweb strings. But without sound understanding of woods and the way they work, not to mention mastery of CNC technology, finishing, and pickup winding, we'd just have a feature list. Instead, we have one of the most finely crafted guitars money can buy, with a host of truly great sounds. As Tom says, "it's meant to be played, meant to be strapped on… crank it up!"